Are you going to travel with your extended family, a bunch of friends or some colleagues and want to find a hotel room that can take up to 12 guests? Or are you simply looking for an extra big and spacious room? Well, then you have come to the right place. At Downtown Camper in Stockholm we have created unique rooms for these occasions. We call them Camper Co-Living. 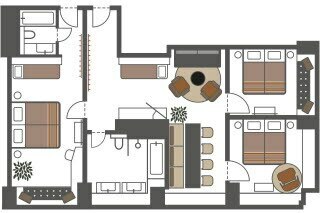 Spacious hotel rooms of 64-95 m² that sleeps 6-12 people. A bed for everyone, common areas for hanging out and socialising, work or eat in peace and quiet. Every room originates from a suite with one or two connecting doors to adjacent rooms. 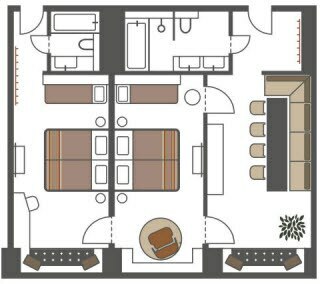 If you choose a Camper Co-Living room you will get a unique solution, more like an apartment than a classical hotel room or suite. All these rooms are situated on the upper floors with a magnificient view. 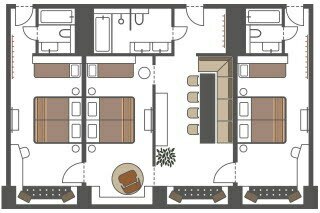 Our Camper Co-Living rooms from 8 people and up are not available for booking online. Contact Downtown Camper directly via telephone or mail. Depending on the size of the room you choose, from 8000 SEK per room and night. The accommodation, a breakfast buffet for the whole group, is included in the price as well as daily activities at no cost, i.e. yoga, running in groups and various different workshops and of course free WiFi. How do the rooms look like? 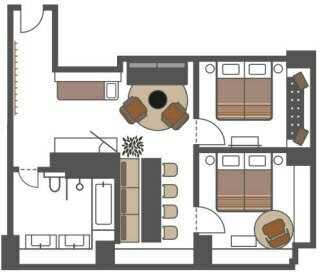 Below you can see the descriptions of the different combinations available of our unique Camper Co-Living rooms taking 6-12 guests. A Camper Grand Suite. The room has two doublebeds and/or bunkbeds or sofa beds. There are two suites with this combination. A Camper Master Suite with a connecting door to an adjacent room. The room has doublebeds and/or bunkbeds or sofa beds. There are two suites of this combination. A Camper Grand Suite with a connecting door to an adjacent room. The room has two doublebeds and/or bunkbeds or sofa beds. There are two suites of this combination. A Camper Master Suite with connecting doors to two adjacent rooms. The room has doublebeds and/or bunkbeds or sofa beds. There are six suites of this combination. We travel in new constellations. With extended families, friends and colleagues. For many of us, the actual size of the room matters when it comes to the hotel experience. We might want to have our own space to retreat to but with access to shared areas where we can socialise, work and eat together. At Downtown Camper 86 of our 494 hotel rooms are so called connecting rooms that can be connected to eachother with a connecting door. Out of these, 16 hotel rooms are part of our unique concept of rooms called Camper Co-Living, rooms that can be adapted and combined to suit the size and needs of different groups. For a big family, a group of friends, hen night or corporate event? Camper Co-Living is an excellent choice for these occasions – get in touch with us today for an offer.